I am busy getting all of my ducks in a row for an upcoming business trip to Europe. 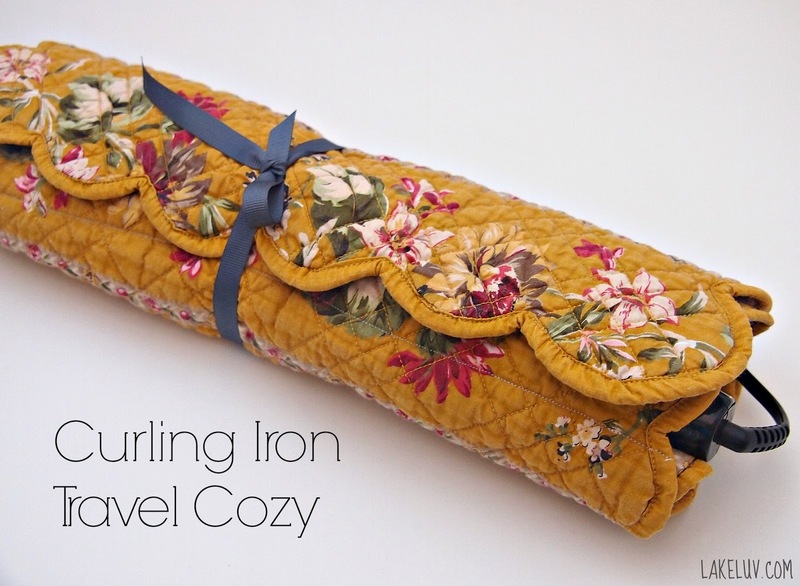 On any trip I take, I make sure to pack my curling iron or flat iron. My hair is a wild mane if I don't tame it with some sort of extremely hot apparatus, and so there are times when I am ready to leave the house or the hotel room to catch my flight when my curling iron is still too hot for my luggage. In order not to burn my clothes, I've realized that a travel cozy is a necessity and I set out to make one this weekend. A few weeks ago, I bought a set of 6 vintage quilted placemats at the local thrift store for $2. I was drawn to the vintage floral pattern and had it in mind to reuse them in different craft projects. For this project I only used one placemat and started by folding in one edge and sewing a straight line at about a third of the way up. I then sewed along the bottom of the third to create a long pocket for the iron. I then flipped the placemat and sewed a ribbon and a bead in a contrasting colour in the centre of the back. This allowed me to place the curling iron in to the long pocket, fold the placemat over and tie the ribbon around it. Before tying it up though, I also sewed on a snap button to make sure the fabric stays in place. I'm pretty happy with the way it turned out and glad that I got to reuse something and didn't have to buy a plastic protector to only throw in a landfill later. I look forward to using it on my trips and keeping my clothes safe from the heat of my hair fryer. Now as for the other 5 placemats... any ideas for what I should make with them?